The actress held a silent protest against Sri and in support of Pawan Kalyan but little did she know that this step would put her in trouble. As earlier we reported, actress Maadhavi Latha began with her silent protest in front of the Telugu Film Chamber of Commerce at Film Nagar in Hyderabad at 10.00 am on Wednesday. The actress took this step in support of power star Pawan Kalyan after Sri Reddy used abusive language on the actor. 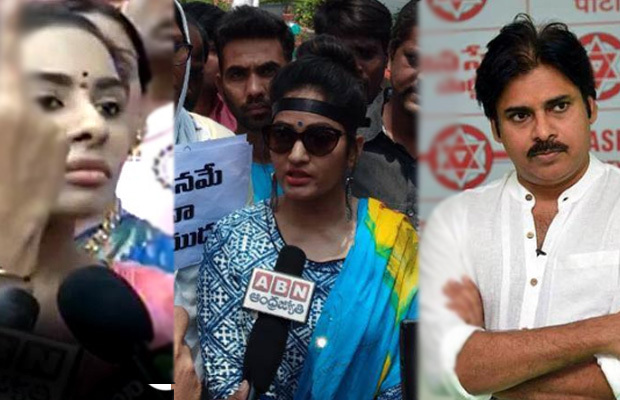 Sri’s unpleasant comments about Pawan Kalyan left everyone angry including many celebrities from the industry and among them was Maadhavi Latha. The actress held a silent protest against Sri and in support of Pawan Kalyan but little did she know that this step would put her in trouble. Yes, the actress was arrested yesterday during her protest. Latha was arrested by the Hyderabad police at 10.30 am. At around 10:30 am, Latha along with five men who were also part of the silent protest in front of the Film Chamber were arrested. They were released later. She was reportedly kept in the custody for four hours. To uninitiated, a few days ago, Pawan Kalyan interacted with the media and reacted to Sri Reddy’s fight on the casting couch. He replied saying that his support will be there but the actress should knock the doors of the law or approach police in order to get justice rather than sensationalizing the whole issue, which will only damage her image. Sri Reddy thanked Pawan for the same and addressed him as ‘anna’ in one of her tweets and filed a case. What a selfish, opportunistic, back-stabbing woman!